FPS is more than pleased to announce another new service. 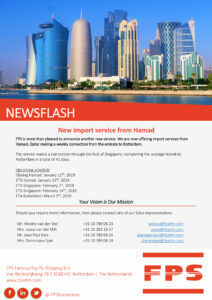 We are now offering import services from Hamad, Qatar making a weekly connection from the emirate to Rotterdam. The service makes a connection through the hub of Singapore, completing the average transit to Rotterdam in a total of 45 days.